The rift between the Zimbabwe Electoral Commission (Zec) and the country's opposition parties taking part in the forthcoming polls has widened in the wake of the short-message service (SMS) saga that erupted on Monday, the Daily News can report. This comes after Zanu-PF mandarins took their electoral campaign several gears up by sending bulk text messages to registered voters in a bid to solicit for their votes ahead of the tricky July 30 plebiscite. While Zec has denied releasing cell phone numbers captured during the biometric voter registration (BVR) exercise to Zanu-PF, its rebuttal has simply served to raise more questions than answers. Zec alleged on Monday that Zanu-PF could have accessed the mobile numbers from service providers, but this was strenuously denied by Econet Wireless - the country's largest mobile cellular operator. NetOne and Telecel, the other operators, have avoided responding to media inquiries on the matter, and understandably so, since they are both owned by government. To add to the mystery, the Postal and Telecommunications Regulatory Authority (Potraz) issued a statement yesterday saying it has no access to people's phone numbers or their polling stations. "Please note that Potraz did not share any subscriber information with third parties, as it does not keep such data. Potraz prohibits operators from sharing subscriber information with third parties," said Potraz — the body that oversees communication companies in Zimbabwe. MDC Alliance leader Nelson Chamisa said the coalition of seven political parties was pushing for full-scale investigations to establish how their nemesis ended with cell phone numbers of registered voters submitted to Zec in confidence during the BVR exercise. 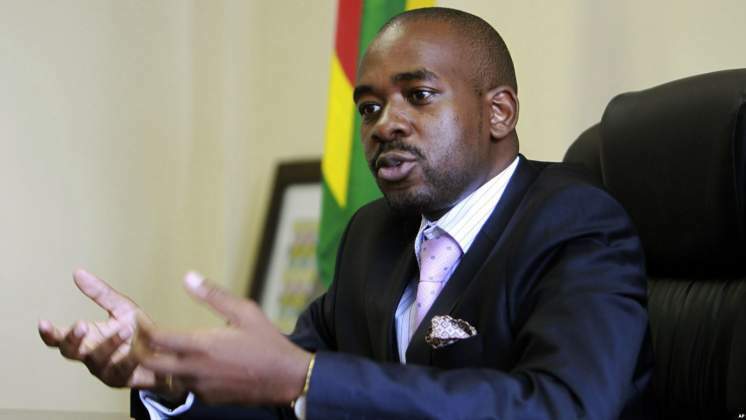 Chamisa described the SMS saga as the biggest political scandal of the year, considering that Zec was supposed to guarantee the privacy of voters. "Zec has become an extension of Zanu-PF. It is surprising that those in Zanu-PF have become spokespersons of Zec. We have the likes of Pupurai Togarepi and Simon Khaya Moyo defending Zec. We have established that there is some sharing of data between Zanu-PF and Zec, and we want that investigated," he said. "The worst and shameful scandal of the year is for Zec to connive and collude with ED and his crew to manipulate the ballot paper and share the electoral voters' roll mobile database. We will defeat them all," added Chamisa. Zanu-PF spokesperson, Simon Khaya Moyo, said the ruling party was not given a voters' roll with contacts details of registered voters as was being alleged. "This is absolute nonsense, Zec is an independent body; they are not part of our structures. We are not going to get into a corner with them, why should we?" asked Khaya Moyo. Pressed to explain how Zanu-PF candidates accessed constituency-specific contact details of registered voters, Khaya Moyo was dismissive, saying "why don't you ask them". The Daily News can reveal that Zanu-PF has established a team of information technology (IT) experts working from its headquarters, in Harare. The IT experts are burning the midnight oil, distributing in batches the contact details to each of the party's aspiring legislators, complete with phone numbers of prospective voters. "Every province has an IT administrator, and we have been given a voters' roll that has phone numbers of people in each constituency. This is a new thing, and we have IT experts who are at hand to transmit the information," said an aspiring Zanu-PF Member of Parliament who cannot be named for fear of reprisals. "We do not know how much is being paid for these SMSes because the party is the one in charge of the task. Everything is being done from the party headquarters, and we are just being told what to do," said another aspiring legislator. Jameson Timba, a senior MDC official and the chief elections agent for the MDC Alliance leader, said it was clear that the Zanu-PF has gone into bed with Zec. "If you want to know the mother of a tokoloshe (humanoid creature) beat it up and the mother will come out. Zanu-PF has come out in the open defending Zec even though there are many things that are wrong with the commission. "That is why you see Zanu-PF's spokesperson Simon Khaya Moyo saying there is nothing wrong with Zec's behaviour — they work together. Our Constitution guarantees that the electoral process should be free, fair and transparent but that is now under threat and the certainty of the outcome now in doubt," said Timba. Academic and scholar Pedzisai Ruhanya weighed in. "Zec, Zanu-PF, military collusion has now been laid bare. Zec has shared with Zanu-PF phone numbers of voters. I have received a message from Zanu-PF's Mashavave to vote for him as MP. I gave this information to Zec only. No ways, I got the message but won't vote for Zanu-PF," Ruhanya wrote on his Facebook page. Zec has for long been accused of rigging national polls in favour of Zanu-PF. To avert the alleged rigging, opposition parties have tabled a string of proposed reforms to level the electoral playing field but these have been shot down by Zec. The resultant fallout has clearly rattled Zec with its chairperson, Priscilla Chigumba, threatening to stop on-going engagements with political parties saying the consensus-building initiatives have failed to find favour in the opposition ranks. "Despite what we have done there is still conflict," Chigumba said.
" … Now the question we are going to have to ask ourselves is should we try and build a consensus given that whatever exercise we have done has failed to build consensus in the first place. Perhaps we should just stick to our very strict constitutional mandate and exclude everyone. These are things we are going to sit down as a commission and discuss and then come back to stakeholders. But at the moment we are aware that there is no consensus."